In this post we will study about Hotspot Volcanism. 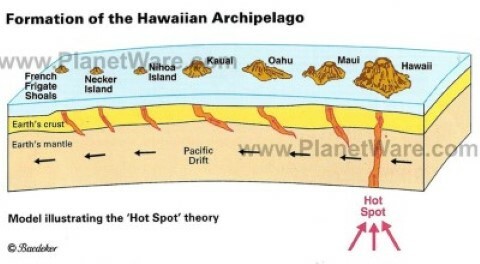 Understanding Hotspot volcanism is important to understand the Formation of Hawaiian Islands and Islands of Indian Ocean such as the Lakshadweep islands, Reunion islands, Chagos archipelago etc. In the previous posts, we have studied about volcanism at convergent and divergent boundaries. 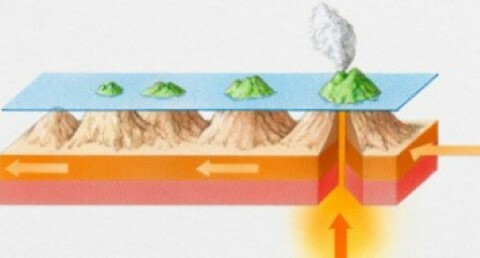 Hotspot Volcanism is somewhat different from the other types because this type of volcanism occurs not at the margins but at the interior parts of the lithospheric plates. 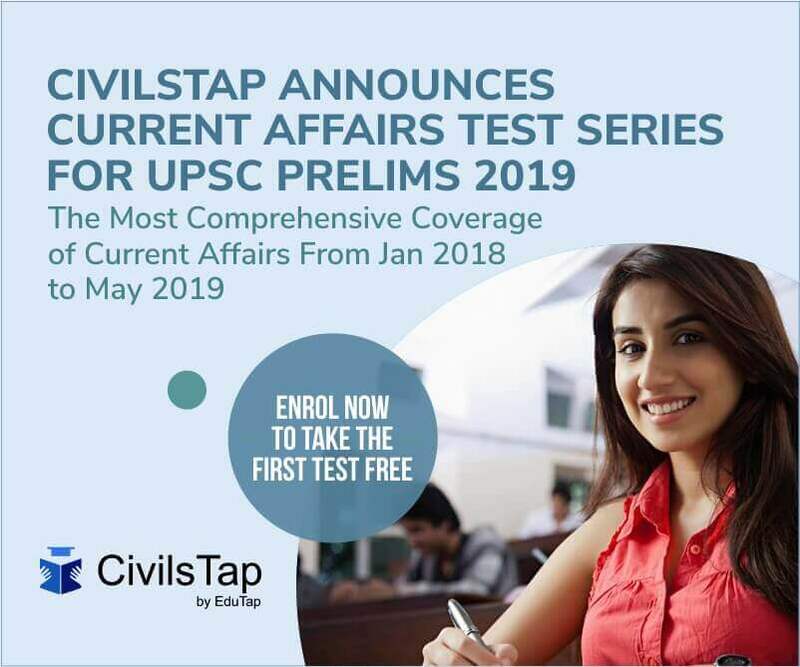 Well known examples include Hawaiian Hotspot Volcanism, Yellowstone Hotspot Volcanism and Reunion Hotspot Volcanism. A hot spot is a region within the Earth’s mantle from which heat rises through the process of convection. This heat facilitates the melting of rock at the base of the lithosphere, where the brittle, upper portion of the mantle meets the Earth’s crust. The melted rock, known as magma, often pushes through cracks in the crust to form volcanoes. 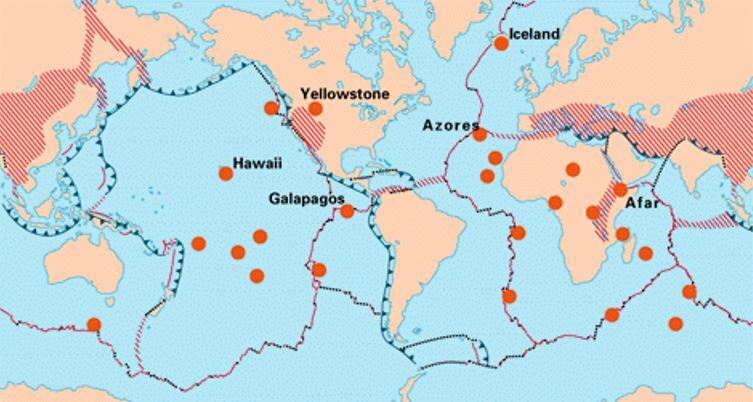 Hot spot volcanism is unique because it does not occur at the boundaries of Earth’s tectonic plates, where all other volcanism occurs. Instead it occurs at abnormally hot centers known as mantle plumes. Mantle plumes are exceptionally hot areas fixed deep below the Earth’s crust. A volcano above a hot spot does not erupt forever. Attached to the tectonic plate below, the volcano moves and is eventually cut off from the hot spot. Without any source of heat, the volcano becomes extinct and cools. This cooling causes the rock of the volcano and the tectonic plate to become more dense. Over time, the dense rock sinks and erodes. A new and active volcano develops over the hot spot creating a continuous cycle of volcanism, forming a volcanic arc. Hot spot seamounts that reach the surface of the water can create entire chains of islands, such as the U.S. state of Hawaii. Reunion islands near Madagascar is also an example of volcanic hotspot. Hot spots can also develop beneath continents. The Yellowstone hot spot, for example, has produced a series of volcanic features that extend in a northeastern direction. The Reunion hotspot is a volcanic hotspot which currently lies under the Island of Reunion in the Indian Ocean. 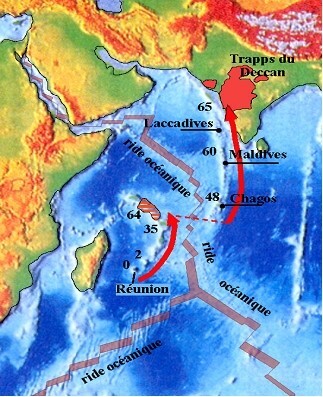 The Chagos-Laccadive Ridge (Lakshadweep is a part of this ridge) and the southern part of the Mascarene Plateau are volcanic traces of the Reunion hotspot. The hotspot is believed to have been active for over 66 million years. A huge eruption of this hotspot 66 million years ago is thought to have laid down the Deccan Traps, a vast bed of basalt lava that covers part of central India, and opened a rift which separated India from the Seychelles Plateau. As the Indian plate drifted north, the hotspot continued to punch through the plate, creating a string of volcanic islands and undersea plateaus. The Laccadive Islands, the Maldives, and the Chagos Archipelago are atolls resting on former volcanoes created 60-45 million years ago that subsequently submerged below sea level. About 45 million years ago the mid-ocean rift crossed over the hotspot, and the hotspot passed under the African Plate. 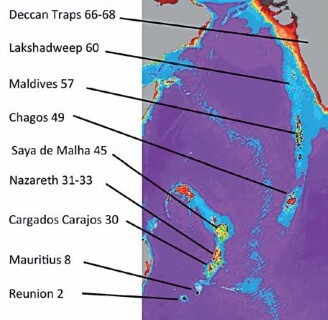 The hotspot appears to have been relatively quiet from 45-10 million years ago, when activity resumed, creating the Mascarene Islands, which include Mauritius, Reunion, and Rodrigues.